“The Simpsons” welcome their new corporate overlords. Notice a picture of Uncle Rupert in the trash can. At Disney Investor Day at Walt Disney Studios in the Los Angeles suburb of Burbank came the new everyone was waiting for. 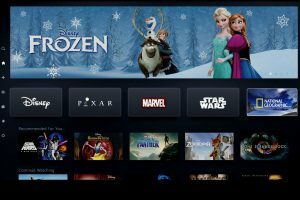 The long-awaited Disney answer to Netflix was finally unveiled Thursday afternoon: known as Disney Plus (or Disney +), brings together the major brands of The Walt Disney Company: Marvel, Star Wars, Pixar, National Geographic, and of course, the Disney name itself. 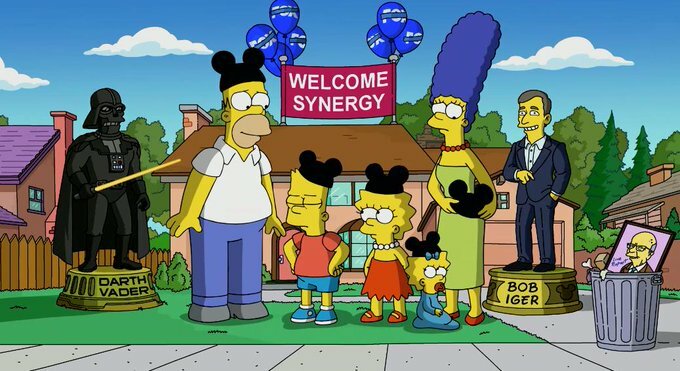 But perhaps the biggest news of all regarding Disney Plus is the availability of every Simpsons episode ever made (with the exception of current season and the Michael Jackson episode) on the service. Q: When is Disney Plus going to drop and how much will it cost? Disney Plus debuts Tuesday November 12 and has a monthly plan for $6.99, or $69.99 yearly. Q: But I want ESPN Plus and Hulu, too. Since they are also owned by Disney, can I get them in a package deal? A bundle plan is being discussed, but nothing has been unveiled yet. Q: What platform would Disney Plus be available on? According to the press release, Disney plus would be available on connected TVs and mobile devices, but they didn’t exactly expand beyond that. But it should be available on Chromecast, Roku, XBox One, PS4, and other platforms. Q: Disney’s brands are being split so I can find what I want. Right? Yes: Pixar, Marvel, Star Wars, National Geographic, and of course, Disney. All will have their own portals. Q: How much original content will be on Disney Plus? Plenty, but too much to cover here. Among the highlights: Marvel plans three live-action series, Falcon And The Winter Soldier, Loki,and Wandavision; a new Star Wars television series The Mandalorian; a new series based on High School Musical; and a Phineas and Ferb movie. Disney plans to have 25 original TV series and ten original films in their first year. Q: And all the Disney films too? Including those “in the vault”? Yep. From Bambi to The Little Mermaid, all Disney animated films (and non-animated too) will be on the service – with the exception of Song Of The South. That’s staying in the vault. Q: Will Disney plan to have ABC shows (such as Grey’s Anatomy, black-ish, etc.) on the service? No. All ABC shows and television library product from Disney-ABC Domestic Television and 20th Century Fox Television are available on Hulu instead, which Disney owns 60 percent of. But Disney Plus does plan to have several family-friendly series on the service, such as Malcolm In The Middle , Home Improvement, and The Bernie Mac Show. Q: No American Idol either? Q: I hear all of The Simpsons back episodes are being made available on the service. Is this true? Absolutely! In a surprise move, Disney announced all off-network Simpsons episodes (excluding the 1991-92 season premiere) will be available on the service when it launches on November 12 – thirty seasons and over six hundred episodes in an exclusive SVOD (subscription video-on-demand) deal. As you can see in the photo above, Bob Iger is their new corporate overlord (and not Rupert Murdoch.) Off-net episodes will continue on FXX, whom Disney picked up in the Fox transaction (off-network recent episodes continue to air weeknights at midnight on Fox Corp.-owned WPWR, who split from its namesake film studio in the Disney deal.) New episodes continue to air Sundays on Fox, but won’t be on Disney Plus until the following season. What Disney Plus’ online portal would look like. Q: What about Bob’s Burgers, King of The Hill, Family Guy, etc. Probably not. Those shows and their full libraries remain exclusively on Hulu. Q: Can I watch Marvel movies on the Marvel portal? Yes. Captain Marvel will be the first movie to become available on the streaming service and will not be on Netflix. All Marvel movies – Avengers, Guardians Of The Galaxy, etc. are going to be on the service. Q: And I can watch the newest season of Jessica Jones on Disney Plus, right? Nope. Jessica is still going to be on Netflix, as is all Marvel Netflix Universe product for the foreseeable future, despite all series in the universe now out of production. Q: So Disney joins Netflix in the streaming wars. And more are coming? Yep: Warner Media is expecting to launch a streaming service in 2020, as is NBCUniversal. Q: That’s a lot of streaming services. How will I pay for them all? Many consumers have the same question. With everyone and their cousin launching a streaming service, the costs are going to add up quick. Might want to consult your accountant. Q: Since it’s syndicated by Disney-ABC, will I be able to watch Tamron Hall’s new talk show on Plus? No first-run syndicated product from Disney-ABC or Twentieth are available on the service. No Live With Kelly and Ryan, either. Q: Will I be able to watch ABC 7 on Disney Plus? I would love to see Cheryl Scott on there. For now, Disney has no plans to put ABC-owned stations or affiliates on Plus. But you can subscribe to Hulu Live to do so. Q: No Cheryl Scott? Come on man. But you can watch all the Hannah Montana and That’s So Raven you want. That’s not a question. But there’s a lot more to discover on Disney Plus. Otherwise, they wouldn’t sink two billion dollars into this venture. Q: Two billion? Wow! The original programming better be damn good. For Disney’s sake, it better be.